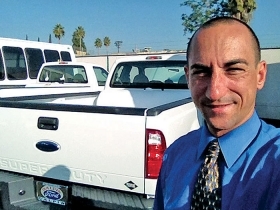 Phil Englander, head of commercial accounts at Galpin Ford in North Hills, Calif., expects the dealership to convert about 80 pickups to run on propane this year. LOS ANGELES -- Propane doesn't make many lists of "green" vehicle fuels. But for some Ford dealers, a factory-authorized program to convert pickups to run on a propane blend looks like a way to boost fleet sales and service business. Propane-based fuel burns cleaner and costs less than gasoline. It qualifies for incentives from the federal government and every state except Wyoming, according to the U.S. Department of Energy Web site. Other automakers' approaches differ, with General Motors delivering converted vans to dealers. Chrysler and Toyota, the other major sellers of light trucks in the United States, do not offer propane conversions. But some Ford dealers see propane-powered vehicles as a promising long-term business -- and good for their green image. They say that fleet customers are warming to propane. "We are offering our customers an alternative," says Phil Englander, head of commercial accounts at Galpin Ford in North Hills, Calif. "It shows our commitment to helping our clients go green." Propane is used in vehicles in a blend called autogas: 95 percent propane and 5 percent other gases. The blend is also called liquefied petroleum gas or LPG. Autogas, when burned, emits 25 percent fewer greenhouse gases than gasoline. And it costs less -- between $1.50 and $2.50 a gallon. But the fuel has a lower energy density, giving it a 10 to 15 percent fuel economy disadvantage. An autogas conversion costs between $10,000 and $13,000, Englander says. Galpin Ford sold 5,010 new and 2,430 used units in 2010. The dealership did about 40 autogas conversions last year, all on F-150 pickups, Englander says. Autogas accounts for about 70 percent of the dealership's alternative fuel business and about 10 percent of its fleet business, he says. Englander says he expects Galpin Ford to do about 80 conversions this year. Many businesses replacing aging fleet vehicles are considering autogas, he says. Pickup sales will get a boost, Englander figures, because "you have to have a vehicle to put propane on." About 100 Ford dealerships nationwide offer autogas conversions, says Todd Mouw, vice president of sales and marketing at Roush CleanTech, a division of Roush Enterprises. Roush develops and manufactures alternative fuel systems for light- and medium-duty Ford trucks and vans. GM outsources its autogas conversions, sending Chevrolet Express and GMC Savana vans from factories to Knapheide Manufacturing Co. in Quincy, Ill., for installation of autogas fuel systems. Roush's Mouw estimates that autogas can be purchased at about 10,000 places around the country, including businesses such as U-Haul and RV rental stores. Companies also can set up their own refueling facilities. Propane autogas has 25 percent less energy density than gasoline, but Roush makes up for some of that difference when it reprograms vehicle powertrain control modules, Mouw says. Roush provides the equipment and trains dealership technicians to do the conversions. It has been working with Ford for six years and is the only company authorized by Ford to do the conversions, Mouw says. The warranty on a converted vehicle is the same as on an unconverted one, he says. Even dealers who do not do conversions can make a profit on sales and service, Mouw says. Tod Schachleiter, service manager at Fuller Ford in Cincinnati, says the seamless warranty coverage was a key point in his decision a year ago to begin offering service on converted Ford pickups. He doesn't yet offer conversions. "I didn't want to get in over my head," he says. Propane, a byproduct of natural gas, is used in vehicles in a blend that is 95% propane and 5% other gases, often butane. The blend is called autogas, liquefied petroleum gas or LPG. Here's how it compares with gasoline as a vehicle fuel. • Fuel efficiency: Autogas has about 25% less energy density than gasoline. Reprogramming a vehicle's powertrain control module can reduce the fuel economy disadvantage to 10 to 15%. • Emissions: Autogas emits 25% fewer greenhouse gases than gasoline. • Availability: The U.S. has an estimated 10,000 propane fueling locations. * AAA Daily Fuel Gauge Report, Nov. 1. His dealership services 12 propane-powered vehicles for the city of Cincinnati. It is also doing a Roush recall to replace the fuel pump on trucks from an Illinois company, Schachleiter says. He figures the propane service will "definitely" be a profit center. "It is another form of income, but I also like that it is another alternative fuel vehicle that is out there," Schachleiter says. The conversions are not an income source for all dealerships. Northside Ford in San Antonio, has not had any conversion customers since it began offering the service, says Service Director Robert Jones. Roush sends him e-mails on conversion events, but they are too far away for him to attend, Jones says. Northside Ford sold 1,579 new and 1,370 used units in 2010. On the other hand, Randy Bennett, service manager at Pearson Ford in Zionsville, Ind., is a big fan of the program. He began offering the conversions in April. In August, the dealership beat aftermarket companies in a bid for a job converting eight city of Indianapolis F-250 pickups to propane autogas. "We have had a lot of buzz," he says, "especially from companies ordering new pickups." The conversion is easy, Bennett says. The gasoline tank is replaced with a propane tank, the fuel lines are replaced and Roush reprograms the powertrain control module. The only performance difference is a slight delay when the key is turned, he says. Bennett figures the conversions will be a new source of income and help sell more pickups. Says Bennett: "Everywhere you turn now, somebody is talking about being green. If they can convert their vehicles and save money and be greener, then why not?"